Homemade Blueberry Coconut Granola Bars-easy to make at home and much better than store bought granola bars! Today, I am headed to The Pioneer Woman’s ranch for a little retreat with my Land O’ Lakes friends. You can follow my ranch adventures on Instagram and I will post about my trip next week. I am sad I have to leave my boys behind, but I am looking forward to some fun girls time! I didn’t want to leave my boys empty handed so I made them Blueberry Coconut Granola Bars to snack on. 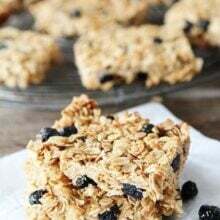 Caleb loves blueberries and coconut, our Baked Blueberry Coconut Oatmeal is one of his very favorite recipes, so I thought he would like these granola bars too! 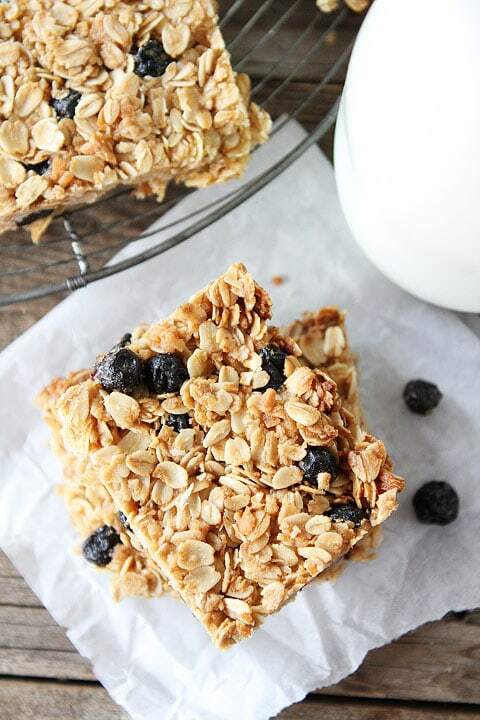 I never buy granola bars at the store because they are so easy to make at home…and they are so much better. Plus, I like knowing what ingredients are going into Caleb’s snacks. I make our No-Bake Peanut Butter Chocolate Chip Granola Bars and No-Bake Biscoff Granola Bars all of the time and they never last long. This time I made Blueberry Coconut Granola Bars for my little pea. I adapted a recipe from my friend Catherine’s book, Weelicious Lunches. She always has the best healthy snack ideas. I used shredded coconut, coconut oil, and coconut extract to make these granola bars. I love the coconut flavor. 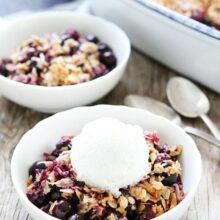 I stirred in dried blueberries for a pop of color and sweetness. I tried to take hurry and take pictures of the granola bars before Caleb saw what I made…but I failed. He smelled the granola bars and came running! I couldn’t stop him from snatching a granola bar. 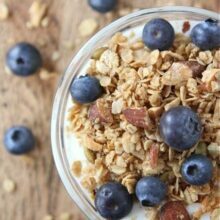 Blueberry coconut granola bars are so easy to make at home and MUCH better than store bought granola bars! 1. Preheat oven to 325 F. Spray a 9x13 pan with cooking spray and line with parchment paper. Set aside. 2. 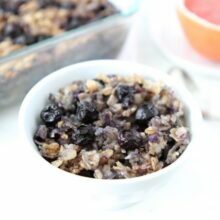 Combine the oats, flour, coconut, brown sugar, salt, and dried blueberries in a large bowl. Stir well. 3. In a separate bowl medium bowl, whisk together the coconut oil, honey, coconut extract, and vanilla extract. Pour the wet ingredients over the oat mixture and stir to combine. 4. Press the granola mixture into the prepared pan. Bake for 40 minute or until the granola bars are golden brown. Allow to cool completely then cut into bars. Serve! Note-Individually wrapped, the bars will remain fresh for several weeks. Can’t wait for tomorrows exciting news! Have a great retreat Maria! 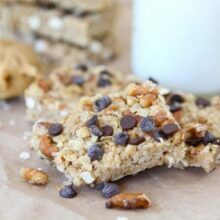 These granola bars look delish..and so much healthier than those store bought ones! I am loving the blueberry/coconut combo here. Have a wonderful trip! I love all the coconut goodness you squeezed into these bars. If there’s one thing that I am crazy about in a granola bar, it’s coconut. Something about the coconut-oat flavor just makes me want more. I think my Lucy Goose would LOVE these!! Have fun at the ranch, I’m HOPING the big news is a GENDER ANNOUNCEMENT!! Love homemade granola bars! Yum! Wow. Pioneer Woman’s ranch…sounds like a blast. Enjoy your time. Have a great time at the ranch! Get up nice and early and enjoy the sunrise and the sounds of the cows – that is one of my best memories. Coffee and just sitting there and listening. This recipe looks delish and Caleb is as cute as ever! Hugs! Have fun on your trip! 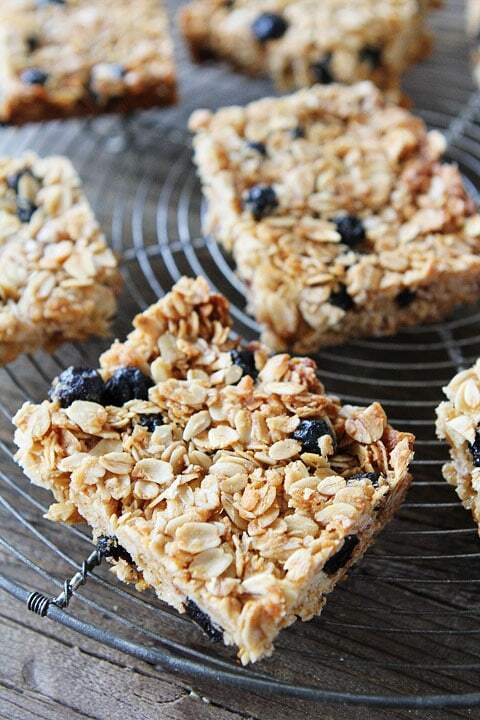 These granola bars are perfect for on the go. Pinned! Love these! Definitely way better than store-bought and so easy to make! these look awesome- have a wonderful trip with the girls and soak up the fun!! 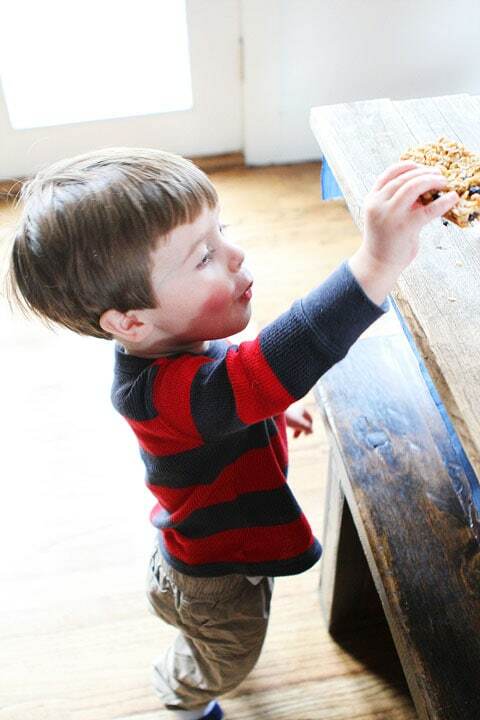 Adorable picture of Caleb and loving this recipe! Have fun at Ree’s ranch! Have a good time in OK.
Have so much fun!! And these bars look amazing, Maria!! 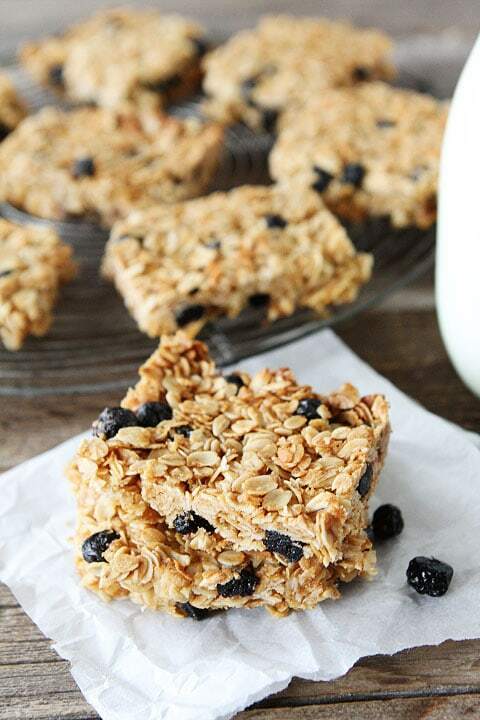 I love a good granola bar, and these look so good!! Perfect for breakfast or as a snack. Love the blueberry/coconut combo. These look like the perfect snack – gorgeous! And little Caleb is such a cutie! Have a blast at The Ranch! These look like great road trip snacks! I have tried the original recipe and the granola bars always end up crunchy. Are they supposed to be soft or crunchy? Mine also tend to end up as granola chunks because they break when I try to cut them. Suggestions? Have fun on the ranch! Love the blueberry and coconut combo! I just made blueberry granola bars very similar to these. I can’t get enough of them! These are gorgeous! Have fun on the ranch! 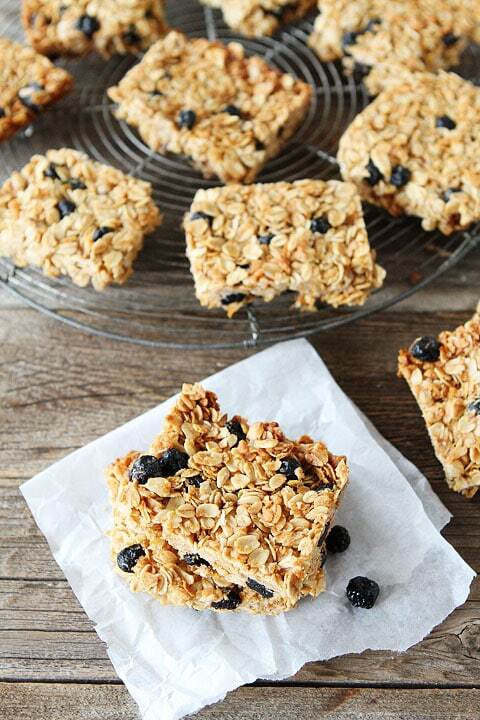 I love homemade granola bars and these look fantastic! These look great, will have to give them a try. Have fun on your trip! I just want to start by saying how jealous I am that you will be visiting Pioneer Woman’s ranch! Second, these granola bars look delicious! I love blueberries and coconut, what a great snack! I have frozen blueberries, can I use those instead? 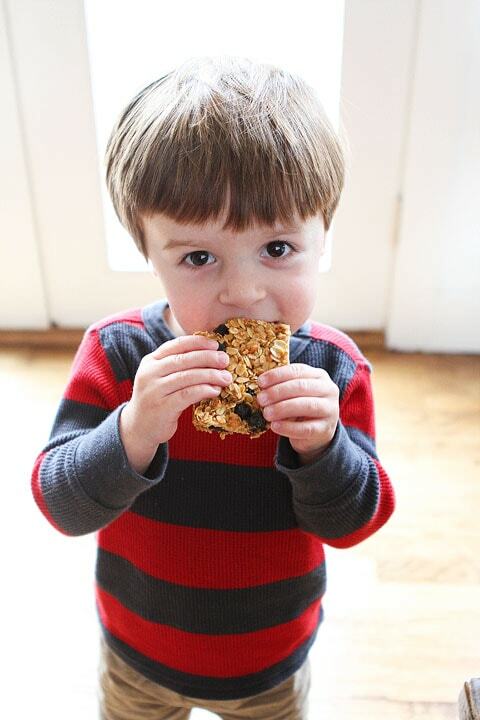 I love homemade granola bars too! These look awesome with the coconut and blueberries. Dried blueberries are so underused. Hello! Just popped these into the oven – I have a feeling I did something wrong because the mixture wasn’t sticky and I’m wondering if they’ll hold together! I’ll let you know how I make out! I made these this morning and they are wonderful! The texture is just right and the blueberries add the perfect sweetness. Yum! Making these tomorrow. Think I’ll add sliced almonds! Hi. This recipe sounds so good. I don’t have coconut oil…can I substitute either butter or vegetable oil? Which one would work best? Thank you. Either one will work. If you use butter, just melt it! Enjoy! just made these and the flavor is fantastic. But I think I did something wrong…they are very cumbley…cannot be cut,,,they just crumble…but they are delicious,,,just won’t stay together? Had to use desiccated coconut instead of shredded. Also didn’t have coconut extract (didn’t know there was such a thing) so I melted in about a tablespoon of coconut cream concentrate instead. Magnificent. Thanks. Like Donna, I made these and they just fell apart. I actually cooked them longer and let them rest and they were completely cool when I cut. They weren’t so much crumbly, rather chewy and sticky. I was not happy. They did taste good though. I made these once before and although they slightly crumbled, they held together for the most part. I used parchment paper this time and would not advise using it again. Just grease a glass pan, press in the granola hard, then bake, and they will stay together better. As much as I like these bars I will look for another granola recipe with blueberry and coconut because I’m not totally pleased with how these come out. Heather, I completely agree with you. Mine are cooling right now for the second time. After the 40 minute cook time and cooling, they just crumbled. I baked them for 15 more mins. and am hoping for the best. They are very tasty but after looking at other similar recipes, I think there is an oat to flour ratio problem? Not sure. Four cups of oats seems excessive and the mixture was dry when it went into to oven. So maybe it might require more oil as well. Any help would be appreciated. This seems to be a chronic complaint about this recipe so it would be appreciated if the host/hostess of this site could comment. Otherwise it is hard to trust any of the other recipes offered. Thanks for you time. Sorry you are having issues. Ours always hold together. You can try decreasing the amount of oats. Maybe try 3 1/2 cups? Hi. Thanks for responding so quickly. I tried them again this morning. I loved the taste and the use of coconut oil so I was determined to make them work. First thing I did was test my oven temperature. Turned out it was about 15 degrees off! It was not hot enough. Lesson learned. I did add about three Tbls. more of flour and coconut oil. It worked perfectly at 40 mins. I also observed that they will harden more past the cooling stage. I am assuming this is somehow related to the coconut oil. I have never baked with it before so this is definitely a learning curve. I love it for cooking. Thanks again. I love this recipe. I now use it as my base and have tried experimenting with other flavors.